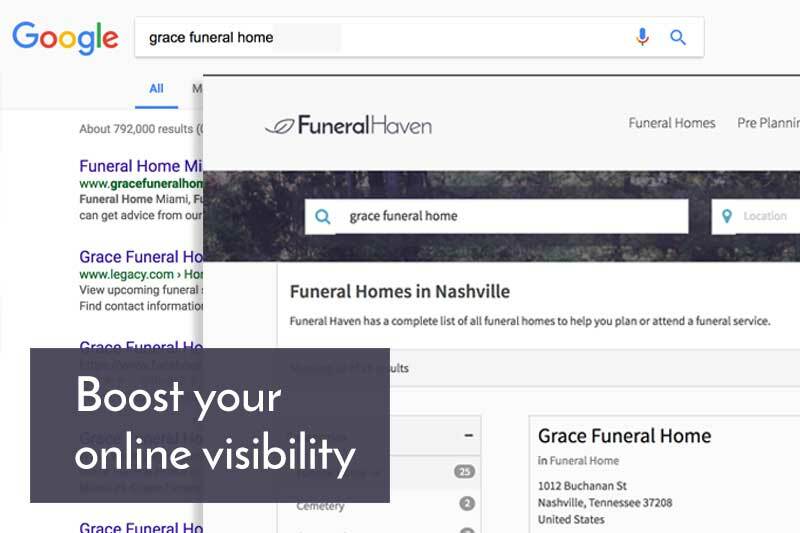 Reach thousands of new customers searching for local funeral services. Showcase your business with beautiful photos and accurate information. More than 20% of potential funeral customers now go online to research and compare options before contacting a funeral director. Our goal is to help your funeral business attract new customers. We use our extensive search engine optimization expertise to reach customers searching for funeral services online. 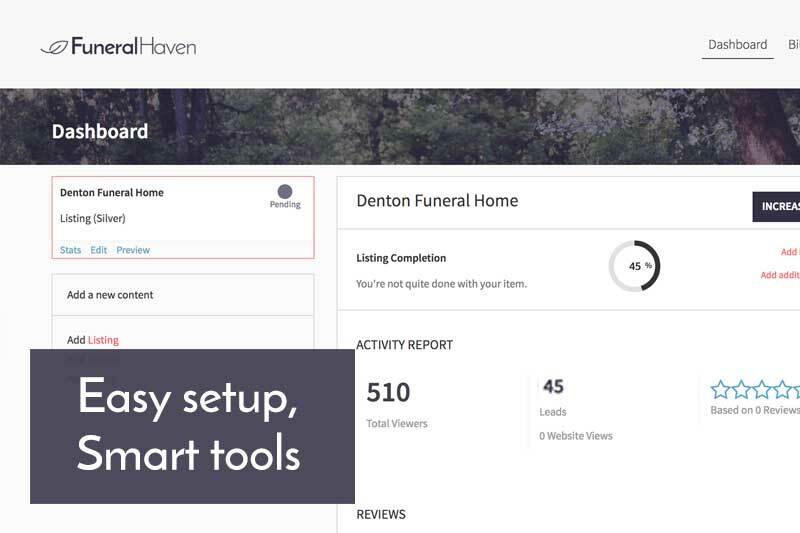 FuneralHaven is an attractive, easy, risk-free way to put your funeral business in front of new customers that don't already have community ties to a funeral home. Strengthen your online brand and improve search visibility and traffic. It's easy to showcase your business with beautiful photos, up-to-date contact information, and a rich description of your history and services. Highlight your reputation and expertise. Stand above the rest in our funeral service provider directories. Our site is mobile-optimized and your business will appear in our soon-to-launch mobile apps. Reach the increasing number of people comparing funeral options online. We show them funeral service providers in their area - they choose you based on your price, reviews, and reputation. Our easy-to-use customer dashboard allows you to update all of your properties, keep track of new leads and view overall performance of your listing. Maximize your visibility, improve your online reputation and attract more customers with premium placement and an enhanced profile. 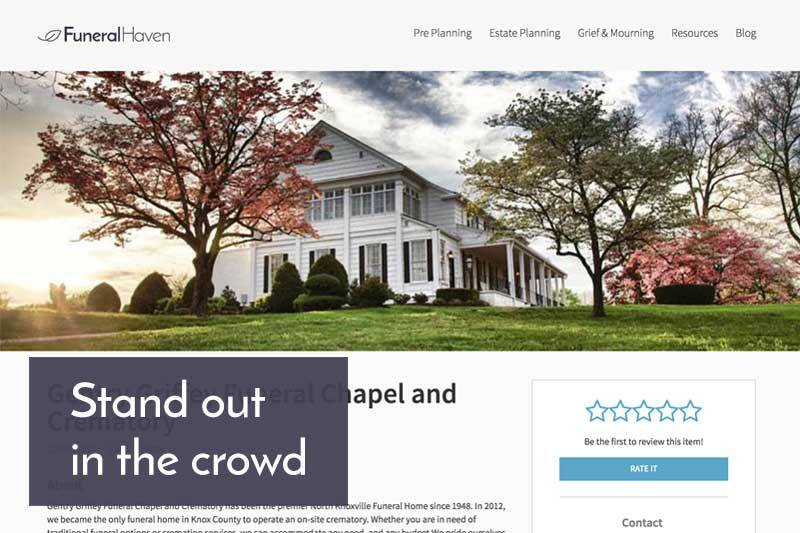 Find and claim your listing in our database of over 20k Funeral Service Providers. Can't find your listing? Choose a plan above to get started. Questions? Want a personalized demo?